Over two hundred years ago, Immanuel Kant wrote that we are “unavoidably side by side”. Since Kant, our mutual interconnectedness and vulnerability have grown in ways he could not have imagined. We no longer inhabit, if we ever did, a world of discrete national communities. Instead, we live in a world of what I like to call “overlapping communities of fate” where the trajectories of all countries are deeply enmeshed with each other. In our world, it is not only the violent exception that links people together across borders; the very nature of everyday living – of work and money and beliefs, as well as of trade, communications and finance, not to speak of the earth’s environment, connects us all in multiple ways with increasing intensity. The word for this story is “globalisation”. It is not a singular, linear narrative, nor is it just a matter of economics. It is cultural as well as commercial and in addition it is legal: it is about power as much as prosperity or the lack of it. From the United Nations to the European Union, from changes to the laws of war to the entrenchment of human rights, from the emergence of international environmental regimes to the foundation of the International Criminal Court, new political narratives are being told – which seek to reframe human activity and entrench it in law, rights and responsibilities that are worldwide in their reach and universal in their principles. The development of this process and the international institutions that embody it began in the immediate aftermath of formidable threats to humankind – above all, Nazism, fascism and the holocaust. After 1945 there was a concerted international effort to affirm the importance of universal principles, human rights and the rule of law in the face of strong temptations simply to ratify an overt system of great power interests favouring only some countries and nations. The traditional view of national and moral particularists, that belonging to a given community determines the moral worth of individuals and the nature of their freedom, was rejected. Instead, the principles of equal respect, equal concern and the priority of the vital needs of all human beings were affirmed. The irreducible moral status of each and every person was placed at the centre of significant post–second world war legal and political developments. Click here to buy David Helds book, which lays out his argument in full. Half a century on, the international community has reached its next clear moment of decisive choice. I am an optimist. I am confident that it is still possible to build on the achievements of the post–second world war era. The proposals that I advocate, and the direction that I argue the international community should take, are easily within our grasp economically and technically. Politically, they demand new efforts, skill and above all a shared will to achieve them. They are not utopian or unrealistic in the sense of being impractical or beyond our mental and physical resources – on the contrary. But it is especially important for those of us who are optimists of possibility to be clear about the dangers and difficulties. A combination of developments points towards a catastrophic combination of negative factors which could lead us into another century marked by war, massive loss of life, and reckless and destructive violence. We are at a turning–point. It will not be measured by days or months, but over the coming few years between now and 2010, choices will be made that will determine the fate of the globe for decades to come. It is that serious. the systematic attack on the multilateral order from the United Nations to a whole series of international agreements and agencies. The signs are not good, therefore. The post–war multilateral order is threatened by the intersection and combination of these crises that are taking place simultaneously at the economic, humanitarian, environmental and political levels. The crisis in each is likely to exacerbate the others. More serious still, there is a driving force taking them from bad to worse. This force is willed, even though it often presents itself in the form of inevitability, and it can be summed up in two phrases: the Washington economic consensus and the Washington security agenda. I will take a hard look at them both. Any assessment of them must be grounded on the issues each seeks to address. But they are also now connected if distinct drivers of the specific form of globalisation which the world is being forced to experience. Together they have become a combined assault on the principles and practice that began to be established after 1945. Together they promulgate the view that a positive role for government is to be fundamentally distrusted and that the sustained application of internationally adjudicated policy and regulation threatens freedom, limits growth, impedes development and restrains the good. Of course, neither exhaustively explains the current structures of globalisation, but they form the core part of its political drive. It does not follow that in terms of economics, what the Washington consensus opposes is good, any more than it follows that the critique of the present working of the UN and international system associated with Washington’s security agenda is entirely false. On the contrary, a merely conservative resistance to them that seeks to hold onto the status quo would also fail to deliver what the world badly needs. provides international security which engages with the causes as well as the crimes of terrorism, war and failed states. But before outlining what this framework needs to deliver, and why the current one fails, a reminder of the four major current crises in trade, the condition of humanity, the environment, and current global governance, which make the call for the creation of a better kind of globalisation imperative. First, the collapse of the trade talks at Cancún raises the prospect of a major challenge to the world trading system. There is a large growth in bilateral trade arrangements and preferential trading agreements, which single out some nation–states for favoured treatment by others. If growth in such bilateral agreements continues, there is a real danger that the Doha trade round will collapse – or produce derisory results. There are many risks involved, the most serious being to the world’s poorest countries. They cannot alone overcome the handicaps of a world trading system marked by rigged rules and double standards. They cannot alone overcome the problem of vast subsidies that the Organisation for Economic Co-operation and Development (OECD) countries offer to their agricultural and related sectors. If the world’s poorest countries (along with middle-income nations) are to find a secure access into the global economic order, they require a free and fair footing so to do. The failure of trade talks at Cancún signals that they may never do so. Second, little progress has been made towards achieving the millennium development goals. These set down minimum standards to be achieved in relation to poverty reduction, health, educational provision, the combating of HIV/Aids, malaria and other diseases, and environmental sustainability. They are the moral consciousness of the international community. Progress towards the millennium targets has been lamentably slow, and at current rates they will be missed by a very wide margin. In fact, there is evidence that there may have been no point in setting these targets at all, so far are we from attaining them in many parts of the world. Third, little, if any, progress has been made in creating a sustainable framework for the management of global warming. The British chief scientist, David King, warned in January 2004 that “climate change is the most serious problem we are facing today, more serious than the threat of terrorism”. Irrespective of whether one finds this characterisation accurate, it is the case that global warming has the capacity to wreak havoc on the world's diverse species, biosystems, and socio–economic fabric. Violent storms will become more frequent, water access a battleground, and the mass movement of desperate people more common. The overwhelming body of scientific opinion now maintains that global warming constitutes a serious threat not in the long term, but in the here and now. The failure of the international community to generate a sound framework for managing global warming is one of the most serious indications of the problems facing the multilateral order. Fourth, the multilateral order is being gravely weakened by the conflict in Iraq and the American administration’s response to the terror attacks of 9/11. The value of the UN system has been called into question, the legitimacy of the Security Council has been challenged, and the working practices of multilateral institutions have been eroded. The arrogance of the great powers has dramatically weakened international law and legitimacy, and the prospects for combating global terrorism have been lessened not improved. How do we address problems on this scale? The economic, political, social and environmental fortunes of all countries are increasingly enmeshed, but the richest and the most powerful nations are not dedicated to building an international order which delivers relief, hope and opportunity to the least well–off and those most at risk, even though this is in their own interests, as well as being in line with their expressed values. A global commitment to justice is essential to ameliorate the radical asymmetries of life–chances that pervade the world. We need structures as well as policies which can address the harm inflicted on people and nations against their will and without their consent. Instead, while there is a high degree of interconnectedness in the world, social integration is shallow and a commitment to social justice pitifully thin. Why? I will focus here on two reasons above all others: the old Washington consensus, and the new Washington security agenda. These two hugely powerful policy programmes are shaping our age and profoundly weakening our public institutions, nationally and globally. Only by understanding their failures and limitations can we move beyond them to recover a democratic, responsive politics at all levels of public life. the protection of intellectual property rights. A combination of most or all of these measures has been the economic orthodoxy for a significant period of the last twenty years in leading OECD countries, and in the international financial institutions. It has been prescribed, in particular, by the IMF and World Bank as the policy basis for developing countries. The “Washington consensus” was first set out authoritatively by John Williamson. While Williamson endorsed most of the approaches listed above, he did not advocate free capital mobility. His original formulation drew together an agenda which he thought most people in the late 1980s and early 1990s in the policy-making circles of Washington DC – the treasury, the World Bank and the IMF – would agree were appropriate for developing countries. Subsequently, the term acquired a sharply right–wing connotation as it became linked to the policies of Ronald Reagan and Margaret Thatcher. They emphasised free capital movements, monetarism and a minimal state that accepts no responsibility for correcting income inequalities or managing serious externalities. There were important overlaps between the original Williamson programme and versions of it which came to be called the neo–liberal agenda, including macroeconomic discipline, lauding the free market economy, privatisation and free trade. Today, however, Williamson distances himself from the neo–liberal definition of the Washington consensus, although he accepts that it was this version, with its endorsement of capital account liberalisation, which became the dominant orthodoxy in the 1990s. I will use the term Washington consensus in the latter sense: to refer not to the theory, but to the policies of American administrations and their close allies and associated institutions. Critics charge that the measures of the Washington Consensus are bound up with US geopolitics, and are all too often preached by the US to the rest of the world but not practised by it, and worse, are deeply destructive of the social cohesion of the poorest countries. Interestingly, Williamson holds that while aspects of such criticism of the neo–liberal version are true, his policy recommendations are sensible principles of economic practice that leave open the question of the progressivity of the tax system. Indeed, some of the proposals and advice of the Washington consensus may be reasonable in their own terms. Others are not. Taken together, however, they represent too narrow a set of policies to help create sustained growth and equitable development. Crucially, the Washington consensus underplays the role of government, the need for a strong public sector, and the requirement for multilateral governance. Put into effect its policies can have disastrous consequences for the capacity of public institutions to solve critical problems, national and global. explain why good “pupils” among the post–Soviet Union transition countries, such as Moldova, Georgia, Kyrgyzstan, Armenia, after setting out in 1991 with no debt at all, and following all the prescriptions of the international financial institutions, find themselves ten years later with their GDPs halved and in need of debt-forgiveness. Something is clearly awry. The dominant economic orthodoxy has not succeeded. Instead, it has failed to generate sustained economic growth, poverty reduction and fair outcomes. The diagnosis of the Washington consensus is misleading and its prescriptions are damaging. In particular it has been found that one of the key global factors limiting the capacity of the poorest countries to develop is the liberalisation of capital. Geoffrey Garrett has shown that what hurts developing countries is not free trade but the free movement of capital. The neo–liberal Washington consensus recommends both. While tariff liberalisation can be broadly beneficial for low–income countries, rapid capital liberalisation can be a recipe, in the absence of prudential regulation and sound domestic capital markets, “for volatility, unpredictability and booms and busts in capital flows”. Countries that have rapidly opened their capital accounts have performed significantly less well in terms of economic growth and income inequality than countries that have maintained tight control on capital movements but cut tariffs. Joseph Stiglitz affirms that both the crises in East Asia in the late 1990s and the recent recessions in Latin America show that “premature capital market liberalisation can result in economic volatility, increasing poverty, and the destruction of the middle classes”. And a study by IMF economists published in March 2003 itself finds that “there is no strong, robust and uniform support for the theoretical argument that financial globalisation per se delivers a higher rate of economic growth”. Even more troubling, the IMF study concludes that “countries in the early stages of financial integration have been exposed to significant risks in terms of higher volatility of both output and consumption”. Yet knowing this, the Bush administration is still leading the way in demanding a tough capital liberalisation through international financial institutions and bilateral trade agreements. As a result the governing capacities of developing countries can be seriously eroded. This is not to say that developing countries do not need access to capital flows whether public or private. They do – especially during trade liberalisation when initially imports tend to rise faster than exports. But private market capital flows are both too low and too volatile to provide for such financial needs. The experience of China and India – following the earlier trajectories of Japan, South Korea and Taiwan – shows that countries do not have to adopt, first and foremost, liberal trade and/or capital policies in order to benefit from enhanced trade, to grow faster, and to develop their industrial infrastructure so as to be able to produce an increasing national consumption. All these countries, as Robert Wade has recently noted, have experienced relatively fast growth behind protective barriers, growth which fuelled rapid trade expansion, focused on capital and intermediate goods. As each of these countries has become richer, it has then tended to liberalise its trade policy. Accordingly, it is a misunderstanding to say that trade liberalisation as such has fuelled economic growth in China and India. Rather, these countries developed relatively quickly behind protective barriers, before they liberalised their trade. Clearly, if these countries, and others like them, did not develop as a result of straightforward trade liberalisation, and if it is also the case that some of the poorest countries of the world are worse off as a result of an excessively fast integration into the global capital market, then there is an overwhelming case for applying the precautionary principle to global economic integration and resisting the developmental agenda of the Washington consensus. While economic protectionism should be rejected as a general strategy because of its risks of creating a vicious circle of trade disputes and economic conflicts, the balance of evidence is clear. For a country to benefit from sustained development, its priority should be internal economic integration – the development of its human capital, of its economic infrastructure and of robust national market institutions, and the replacement of imports with national production where feasible. Initially, this needs to be stimulated by state–led economic and industrial policy. Greater internal economic integration then helps generate the conditions in which a country can benefit from higher external integration as Robert Wade has shown. The development of state regulatory capacity, a sound public domain and the ability to focus investment on job-creating sectors in competitive and productive areas – all this is far more important than the single–minded pursuit of integration into world markets. The alternative to the Washington consensus is not a simple endorsement of state–centric development nor is state intervention always progressive and beneficial just because it runs counter to it. Rather, the Washington consensus has eroded the ability to formulate and implement sound public policy and has damaged essential political capacity. Public objectives, for example, can be delivered by a diversity of actors, public and private, with partnerships between them – and not just by the state. The wider development of civil society (trade unions, citizen groups, NGOs and independent institutions) is indispensable to a robust programme of national development. Of course, there will be conflicts between economic development and the strengthening of civil society. But societies need significant measures of autonomy to work out their own ways of managing these conflicts. There is, in fact, no single pre–ordained route or set of policy prescriptions to economic development. Knowledge of local conditions, experimentation with suitable domestic institutions and agencies and the nurturing of internal economic integration need to be combined with sound macroeconomic policy and some elements of external market integration. This is what economic government is about. The most successful recent cases of development – East Asia, China, India – have managed to find ways of taking advantage of the opportunities offered by world markets – cheaper products, exports, technology and capital – while entrenching domestic incentives for investment and institution–building. Development thinking has to shift from a dogged focus on “market access” to a much wiser and complex mindset. Developing nations need policy space to exercise institutional innovations that depart from orthodoxies of the World Bank, IMF and WTO. In parallel, organisations like the WTO must move their agendas away from a focus on market creation and supervision towards a broader range of policies which encourage different national economic systems to flourish within a fair and equitable rule–based global market order. the underemployment or unemployment of productive resources in the context of the demonstrable existence of urgent and unmet needs. the development of serious transnational problems involving the global commons. Indeed, pushing back the boundaries of state action and weakening governing capacities in order to increase the scope of market forces in a society will mean cutting back on services which have offered protection to the vulnerable. The difficulties faced by the poorest and the least powerful – north, south, east and west – will be worsened not improved. The rise of “security” issues to the top of the political agenda reflects, in part, the need to contain the outcomes which such policies help provoke. By weakening the culture and institutions of government and public life – locally, nationally and globally – the Washington consensus has eroded the capacity of countries around the world to provide urgently needed public goods. It has confused economic freedom with economic effectiveness. Economic freedom is championed at the expense of social justice and environmental sustainability, with long–term damage to both. The Washington consensus has come under assault from many sides in recent years, from special domestic lobbies demanding protection for certain economic sectors (agriculture, textiles, steel) to the anti–globalisation, environmental and social justice movements. The poor results and performance of the Washington consensus which I have summarised have invoked deep unease and criticism. Disappointing economic growth and increasing insecurity in many parts of Latin America, economic stagnation or decline in many sub–Saharan countries, the Asian financial crisis and the stark difficulties experienced in some of the transition economies has led to a call to replace or broaden the policy range of the Washington consensus. As a result, within the IMF, World Bank and other leading international organisations, there has been an attempt to respond to criticism by broadening the consensus to encompass the need for state capacity, poverty reduction and social safety nets. Slowly, attention has shifted from an exclusive emphasis on liberalisation and privatisation to a concern with the institutional underpinnings of successful market activity. A new agenda has emerged which still champions large parts of the old agenda, but adds governance and anti–corruption measures, legal and administrative reform, financial regulation, labour market flexibility and the importance of social safety nets. It can be called “the augmented Washington consensus”. The new emphasis, among whose most prominent advocates is Peter Sutherland, founder of the World Trade Organisation, is helpful and welcome. But, as Rodrik has emphasised, “the institutional basis for a market economy is not uniquely determined. There is no single mapping between a well–functioning market and the form of non–market institutions required to sustain it”. The new agenda gives excessive weight to Anglo–American conceptions of the proper type of economic and political institutions such as flexible labour markets and financial regulation. In addition, the whole agenda is shaped by what is thought of as the necessary institutions to ensure external economic integration, such as the introduction of WTO rules and standards. The new agenda provides no clear guidance on how to prioritise institutional change and gives little recognition to the length of time it has taken to create such developments in countries where it is well advanced. After all, nearly all the industrial countries which have nurtured these reforms did so over very substantial time periods. A more sophisticated, fairer and integrated framework is needed at the international level to address the real needs of the many poorer, developing nations, social, economic and political. Are we moving in this direction? No, instead a new security agenda geared to the supposed interests of the United States is being deployed. It is to this we must now turn. The terrorist attack on the World Trade Centre and the Pentagon was a defining moment for the history of today’s generations. In response, the US and its major allies could have decided that the most important and effective way to defeat global terrorism and prevent it from becoming a torrent would be to strengthen international law and enhance the role of multilateral institutions. They could have decided it was important that no single power or group should act as judge, jury and executioner. They could have decided that global hotspots like the Israel / Palestine conflict which feed global terrorism should be the main priority for coordinated international efforts. They could have decided that the disjuncture between economic globalisation and social justice needed more urgent attention, and they could have decided to be tough on terrorism and tough on the conditions which lead people to imagine that al–Qaida and similar groups are agents of justice in the modern world. Instead they have systematically failed to decide any of these things. Since 9/11, the world has become more polarised, international law has become weaker, and the systematic political failings of the Washington consensus have been compounded by the triumphs of new Washington security doctrines. The rush to war against Iraq in 2003 was gravely misconceived. I argued at the time in openDemocracy that it was the wrong war, in the wrong place at the wrong time. Now it can also be seen how globally it gave priority to a narrowly conceived security agenda which is at the heart of the new American doctrine of unilateral and pre–emptive war. This agenda contradicts most of the core tenets of international politics and international agreements since 1945. It throws aside respect for political negotiations among states, as it does the core doctrine of deterrence and stable balance of power relations among major powers. A single country which enjoys military supremacy to an unprecedented extent has decided under its current president to use that supremacy to respond unilaterally to perceived threats (which may be neither actual nor imminent), and that it will brook no rival. The new doctrine has many serious implications. Among these are a return to the view of international relations as, in the last analysis, a “war of all against all”, in which states rightly pursue their national interests unencumbered by attempts to establish internationally recognised limits (self–defence, collective security) on their ambitions. Once this “freedom” is granted to the USA, why not also to Russia or China; India or Pakistan; North Korea or Iran? It cannot be consistently argued that all states bar one must accept limits on their self–defined goals and that this can be called law. It will not take long for such an approach to become manifestly counter–productive. What the world needs is a much broader indeed global security agenda that requires three things of governments and international institutions – all currently missing. First, there must be a commitment to the rule of law and the development of multilateral institutions that can prosecute or validate war when necessary. Civilians of all faiths and nationalities need protection. Terrorists and all those who systematically violate the sanctity of life and human rights must be brought speedily and firmly before an international criminal court system that commands cross–national support and can deliver justice. Internationally sanctioned military action must be developed to arrest suspects, dismantle terrorist networks and deal with aggressive rogue states. But such action should always be understood as a robust form of international law enforcement, above all as a way, as Mary Kaldor has most clearly put it, of protecting civilians and bringing suspects to trial. Clearly, if justice is to be dispensed impartially so as to ensure international support, no power can act as judge, jury and executioner. What is needed is momentum towards global – not American or Russian or Chinese or British or French – justice. We must act together to sustain and strengthen a world based on common rules to ensure basic human security and protection. Second, a sustained effort has to be undertaken to generate new forms of global political legitimacy for international institutions involved in security and peacemaking. This must include the condemnation of systematic human rights violations wherever they occur, and the establishment of new forms of political and economic accountability that go well beyond the occasional one–off efforts to create a new momentum for peace and the protection of human rights that have been all too typical of world affairs since 1945. Third, as already argued, there must be a head–on acknowledgement that the ethical and justice issues posed by the global polarisation of wealth, income and power, and with them the huge asymmetries of life–chances, cannot be left to markets to resolve. It is not just the case that those who are poorest and most vulnerable, and are linked into geopolitical situations where their claims have been neglected for generations, may provide fertile ground for terrorist recruiters. Terrorism can breed in well–off societies and can be led by middle or, as with Osama bin Laden, upper-class figures. But one of the principles of eliminating terrorism has to be to remove those real injustices which terrorists may use, however opportunistically, to further their support and legitimise their methods. For one consequence of globalisation of communications is that the experience of injustice in one part of the world can be shared elsewhere. Of course, terrorist crimes of the kind witnessed on 9/11 and on occasions since (in Chechnya, Indonesia, Saudi Arabia, Pakistan, Morocco and Spain) are in part the work of the deranged and the fanatic and so there can be no guarantee that a more just and institutionally stable world will be peaceful in all respects. But if we turn our back on the project of creating such a world, there will be no hope of ameliorating the social basis of disadvantage experienced in the poorest and most dislocated countries. Gross injustices, linked to a sense of hopelessness, will then feed anger and hostility. Popular support against terrorism depends upon convincing people that there is a legal and peaceful way of addressing such grievances. Without this sense of confidence in public institutions and processes, the defeat of terrorism becomes a hugely difficult task, if it can be achieved at all. Any attempt to develop international law, to enhance the capacity of international institutions for peacekeeping and peace–making, and to build bridges between economic globalisation and the priorities of social justice will itself be threatened by terrorism and the dangers of extensive terrorist networks. But it is also being endangered by the deeply misguided responses to terrorism we are now witnessing. The new security agenda of the American neo–conservatives, alongside the National Security doctrine of the current American administration, arrogates to the United States the global role of setting standards, weighing risks, assessing threats and meting out justice. It breaks with the fundamental premises of the post–1945 world order with its commitment to deterrence, stable relations among major powers and the development of multilateral institutions to address common problems. Clearly, the issues of security and terrorism are deeply contested. But there are a number of very pressing issues which need to be addressed if we are to salvage the achievements of the post–Holocaust world and build on them in a manner that provides not just security in the narrowest sense (protection from the immediate threat of coercive power and violence), but security in the broadest sense – what I call “human security” that seeks to ensure protection for all those whose lives are acutely vulnerable. understanding that effective, transparent and accountable global governance requires reliable income streams, from aid to new financial facilities (as proposed by the British finance minister, Gordon Brown) and, in due course, new tax revenues (for example, based on GNP, energy usage or financial market turnover). I assess how each of these possibilities might be realised in Global Covenant. Here, I will consider just one of the more critical issues before turning to how such an overall programme might be achieved. How can we justify humanitarian armed intervention should circumstances so demand? Three compelling accounts have recently acknowledged this question. First the report (published in December 2001) of the Canadian–sponsored International Commission on Intervention and State Sovereignty emphasises the importance of a responsibility to protect people in the face of large–scale loss of life or ethnic cleansing. And it links this responsibility to additional principles, which concern the use of proportional means including last resort use of military power, in the face of severe tests to human well–being, among other considerations. A second account is offered by Anne-Marie Slaughter. She focuses on three factors which, when present simultaneously, might justify armed humanitarian intervention: possession of weapons of mass destruction; grave and systematic human rights abuses; and aggressive intent with regard to other nations. Third, Kenneth Roth of Human Rights Watch has argued that humanitarian intervention could be justified if it meets a number of conditions: that it is an intervention of last resort; motivated by humanitarian concerns; guided by, and maximises, compliance with international humanitarian law; likely to achieve more good than bad; and legitimated via the UN Security Council. Pressing additional questions arise. These include how one weighs the balance of the different factors involved, how one creates a framework that can be applied to all countries (and not just to those perceived as a threat by the west) and how one creates a new threshold test for the legitimate use of force. All the positions which emerge in this regard need to be tested against the views and judgments of peoples from around the world and not just against the views of those from the most powerful nation-states, if any new solution is to be durable and legitimate in the long run. This will call for, I argue, a global legal convention. We need to bear in mind that no modern theory of the nature and scope of the legitimate use of power within a state runs together the roles of judge, jury and executioner. Yet this is precisely what we have allowed to happen in the global order today. We need new bodies at the global level for weighing evidence, making recommendations, and testing options. These need to be separate and distinct bodies which embody a separation of powers at the global level. Because if one is in favour of legitimate humanitarian intervention one also needs to ask who is going to make these decisions and under what conditions. The weight of argument points in favour of taking seriously the necessity to protect peoples under extreme circumstances, and it also points in the direction of amending the institutional structures which pass judgment over these pressing matters. These structures need to be open, accountable and representative. Without suitable reform, our global institutions will forever be burdened by the mantle of partiality and illegitimacy. At the centre of my argument and proposals is the need to connect the security and human rights agendas and to bring them together into a coherent international framework. To achieve this a global convention is needed to draw up a new covenant for the world. Rather than set out a blueprint of what the results of such a convention should be, it is important to stress the significance of a legitimate process that both reviews the security and human rights sides of international law and also seeks to reconnect them in a global legal framework. This must, in addition, be linked to a larger social and economic framework of global governance, setting fundamental standards for all human life. One demonstrable result of such an initiative could be new procedures at the UN to specify the set of conditions which would constitute a threat to the peace and the well-being of humankind sufficient to justify the use of force. The question is often put in the form: do we need to amend the UN Charter to create new triggers for war or armed intervention in the affairs of a country because of its internal policies? But there is a much greater question which any such convention needs to address. Across the developing or majority world, issues of global justice with respect to government and legal human rights are not regarded as a priority on their own, and are unlikely to be perceived as legitimate concerns, unless they are connected with fundamental humanitarian issues rooted in social and economic well-being, such as basic education, clean water and public hygiene. Mary Robinson has made the case eloquently and shows how the application of existing international protocols would greatly advance the entire human rights agenda. Traditionally, social democrats have sought to deploy the democratic institutions of individual countries on behalf of a particular national project; a compromise between the powers of capital, labour and the state which seeks to encourage the development of market institutions, private property and the pursuit of profit within a regulatory framework that guarantees not just the civil and political liberties of citizens, but also the social conditions necessary for people to enjoy their formal rights. Social democrats have rightly accepted that markets are central to generating economic well-being, but recognised that in the absence of appropriate regulation they suffer serious flaws – especially the generation of unwanted risks for their citizens, an unequal distribution of those risks, and the creation of additional negative externalities and corrosive inequalities. In the build-up to, during and then after the second world war, many western countries sought to reconcile the efficiency of markets with the values of social community (which markets themselves presuppose) in order to develop and grow. The way the balance was struck took different forms in different countries, reflecting different national political traditions: in the US, the New Deal, and in Europe, social democracy or the social market economy. Yet however this balance was exactly conceived, governments, as John Ruggie has stressed, played the key role in enacting and managing this programme: moderating the volatility of transaction flows, managing demand levels and providing social investments, safety nets and adjustment assistance. Although for a few decades after the second world war it seemed that a satisfactory balance could be achieved between self-government, social solidarity and international economic openness – at least for the majority of western countries, and for the majority of their citizens – it now appears a balance will be increasingly hard to sustain. Today, the mobility of capital, goods, people, ideas and pollutants increasingly challenges the capacity of individual governments to develop their own social and political compromises within delimited borders. New problems are posed by the increasing divergence between the extensive spatial reach of economic and social activity, and the traditional state-based mechanisms of political control. Moreover, these problems cannot be resolved within the framework of the Washington consensus, old or new. Equipped with its policies, governance at all levels has too often been simply disarmed or naively reshaped. Thus, while the concepts and values of social democracy are of enduring significance, the key challenge today is to elaborate their meaning, and to re-examine the conditions of their entrenchment, against the background of the changing global constellation of politics and economics. In the current era, social democracy must be defended and elaborated not just at the level of the nation-state, but at regional and global levels as well. The provision of public goods can no longer be equated with state-provided goods alone. Diverse state and non-state actors shape and contribute to their provision – and they need to do so if some of the most profound challenges of globalisation are to be met. Moreover, some core public goods have to be provided regionally and globally if they are to be provided at all. From the establishment of fairer trade rules and financial stability to the fight against hunger and environmental degradation, the emphasis needs to be on finding durable modes of international and transnational cooperation and collaboration. the regulation of the global economy – through public management of global trade and financial flows and engagement of leading stakeholders in corporate governance. These guiding orientations set apart the politics of what I call “global social democracy” from both the pursuit of the Washington consensus and from those who oppose globalisation in all its forms. Social democracy at the level of the nation-state means being tough in pursuit of free markets while insisting on a framework of shared values and common institutional practices. At the global level it means pursuing an economic agenda which calibrates the freeing of markets with poverty reduction programmes and the immediate protection of the vulnerable – north, south, east and west. This agenda must be pursued while ensuring that different countries have the freedom they need to experiment with their own investment strategies and resources within a legal convention that binds states to basic standards. Economic growth on its own can provide a powerful impetus to the achievement of human development targets. But unmanaged economic development which primarily benefits the already entrenched interests of the global economy will never be geared to prosperity for all. Economic development needs to be conceived as a means to an end, not an end in itself. Understood accordingly, it should be recognised that while international trade has huge potential for helping the least well-off countries to lift themselves out of poverty, and for enhancing the welfare and well-being of all nation-states, the current rules of global trade, as already indicated, are structured to protect the interests of the well-off against the interests of the poorest countries as well as many middle-income ones. Free trade is an admirable objective for progressives in principle, but it cannot be pursued without attention to the power asymmetries of the global economy and to the poorest in the low and middle-income countries who are extremely vulnerable to the initial phasing in of external market integration (especially of capital market liberalisation), and who have few resources, if any, to fall back on during times of economic transformation. A similar thing can be said, of course, for many people in wealthier societies. While they are not exposed to the unequal rules, double standards and inequalities of the global economic order in a parallel way to developing countries, if they lose their jobs or have to settle for lower wages, they are also vulnerable in times of major economic shifts. Any social democratic agenda for free markets must simultaneously address the needs of the vulnerable wherever they are. For the poorest countries this will mean that development policies must be directed to challenge the asymmetries of access to the global market, to ensure the sequencing of global market integration, particularly of capital markets, to experiment with different kinds of investment strategy, to build a robust public sector, to ensure long-term investment in health care, human capital and physical infrastructure, and to develop transparent, accountable political institutions. In developed countries this will mean the continued enhancement of strong, accountable political institutions to help mediate and manage the economic forces of globalisation, and the provision of, among other things, high levels of social protection and supporting safety nets, alongside sustained investment in lifelong learning and skills acquisition. It is striking how seldom this range of policies has been pursued. This seems more a matter of psychology and political choice, and less a matter related to any fundamental obstacles in the nature of the economic organisation of human affairs. instituting a substantial international review of the functioning of the Bretton Woods institutions, created more than fifty years ago, and now operating in an economic context that has drastically changed. If developed countries especially want swift movement to the establishment of global legal codes that will enhance security and ensure action against the threats of terrorism, then they need to be part of a wider process of reform on these lines that addresses the insecurity of life experienced in developing societies. Do we have the resources to put such a programme into effect? We may lack the will but it cannot be said that we lack the means. A few telling examples make the point. The UN budget is $1.25 billion plus the necessary finance for peacekeeping per annum. Against this, US citizens spend over $8 billion per annum on cosmetics, $27 billion per annum on confectionery, $70 billion per annum on alcohol and over $560 billion per annum on cars. (All these figures are from the late 1990s and so are likely to be much higher now.) Or take the European Union: its citizens spend $11 billion per annum on ice-cream, $150 billion per annum on cigarettes and alcohol, while the EU and the US together spend over $17 billion per annum on pet food. What do we require to make a substantial difference to the basic well-being of the world’s poorest? Again, statistics are available. Required would be $6 billion per annum on basic education; $9 billion per annum for water and sanitation; $12 billion per annum for the reproductive health of women; and $13 billion per annum for basic health and nutrition. These figures are substantial but, when judged against major consumption expenditure in the US and EU, they are not beyond our reach. Moreover, if all the OECD agricultural subsidies were removed and spent on the world's poorest peoples this would release some $300 billion per annum. It can be noted that a 0.5% shift in the allocation of global GDP would also release over $300 billion per annum. In addition, a small shift between military and aid budgets (respectively $900 billion a year and $50 billion a year globally) would make a marked difference to the human security agenda. Clearly, the economic resources do exist to put in place reforms to aid the world’s poorest and least well-off. The question really is about how we allocate available resources, to whose benefit and to what end. It is not a question of whether there are adequate economic resources, it is a question of how we choose to spend them. We can decide to meet the challenges so clearly facing the world. We know the dangers, the answers are within our grasp. 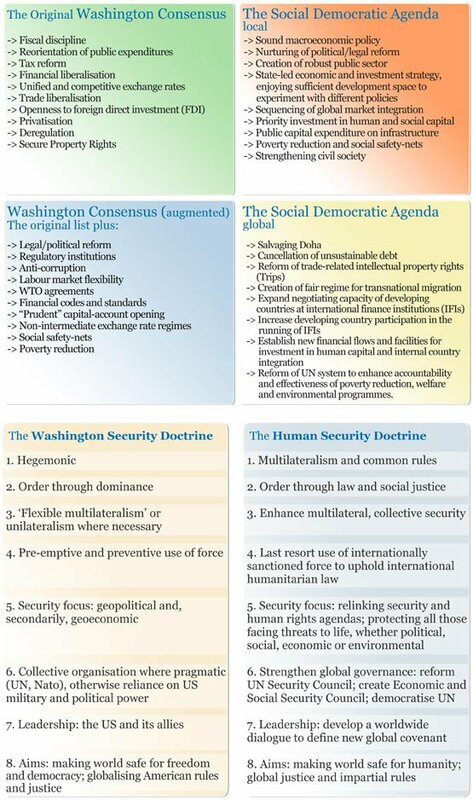 There are four elements to the argument: 1) a critique of the Washington consensus, 2) the way it has now been been reinforced by the Washington security agenda, 3) the need to replace the Washington aonsensus with a global social democratic one, and 4) the need to replace the Washington security agenda with a human security one. It is important to understand that the four elements are distinct. It is possible to advocate the combination of the Washington consensus and the human security agenda, as a supporter of President Clinton might do. 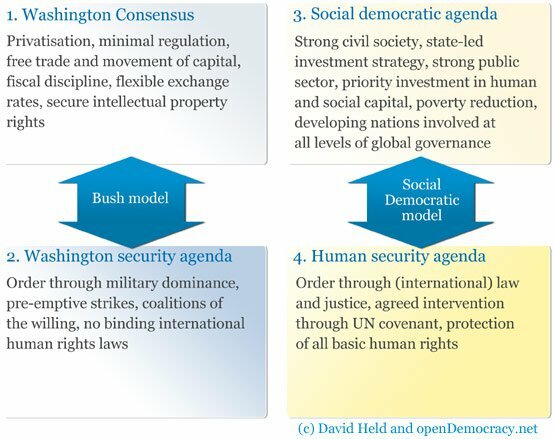 Nonetheless, while the Bush security doctrine only intensifies the negative aspects of the Washington consensus and is not essential to it, it is unlikely that a social democratic consensus could succeed without the reinforcement of a human security agenda. Below, the different elements are spelt out in more detail. 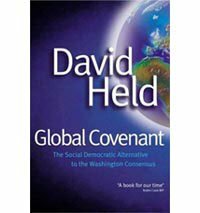 This essay explores themes examined at greater length in Global Covenant: The Social Democratic Alternative to the Washington Consensus, published by Polity press in April 2004. The author would like to thank Robert Wade, Jonathan Perraton and Mathias Koenig-Archibugi for criticism of earlier drafts of this essay; also, Dani Rodrik for permission to use an adapted version of his tables.